Maximilian I (Ferdinand Maximilian Joseph Maria; 6 July 1832 – 19 June 1867) was the only monarch of the Second Mexican Empire. He was a younger brother of the Austrian emperor Franz Joseph I. After a distinguished career in the Austrian Navy as its commander, he accepted an offer by Napoleon III of France to rule Mexico, conditional on a national plebiscite in his favour. France (along with the United Kingdom and Spain, who both withdrew the following year after negotiating agreements with Mexico's republican government) invaded the Mexican Republic in the winter of 1861, as part of the War of the French Intervention. Seeking to legitimize French rule in the Americas, Napoleon III invited Maximilian to establish a new pro-French Mexican monarchy. With the support of the French army and a group of conservative Mexican monarchists hostile to the liberal administration of the new Mexican president, Benito Juárez, Maximilian traveled to Mexico and declared himself Emperor of Mexico on 10 April 1864. The Empire managed to gain recognition by several European powers including Britain, Austria, and Prussia. The United States however, continued to recognize Juárez as the legal president of Mexico. Maximilian never completely defeated the Mexican Republic; Republican forces led by President Benito Juárez continued to be active during Maximilian's rule. With the end of the American Civil War in 1865, the United States (which had been too distracted by its own Civil War to confront the Europeans' 1861 invasion of what it considered to be its sphere of influence) began more explicit aid of President Juárez's forces. Matters worsened for Maximilian after French armies withdrew from Mexico in 1866. His self-declared empire collapsed, and he was captured and executed by the Mexican government, which then restored the Mexican Republic. His wife, Charlotte of Belgium (Carlota), who had left for Europe earlier to try to build support for her husband's regime, suffered an emotional collapse after his death and apparently became insane. Maximilian was born on 6 July 1832 in the Schönbrunn Palace in Vienna, capital of the Austrian Empire. He was baptized the following day as Ferdinand Maximilian Joseph. The first name honored his godfather and paternal uncle, The King of Hungary and the second honored his maternal grandfather, The King of Bavaria. 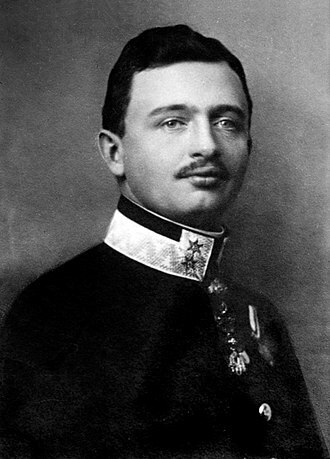 His father was Archduke Franz Karl, the second surviving son of The Emperor of Austria, during whose reign he was born. Maximilian was thus a member of the House of Habsburg-Lorraine, a female-line cadet branch of the House of Habsburg. His mother was Princess Sophie of Bavaria, a member of the House of Wittelsbach. Intelligent, ambitious and strong-willed, Sophie had little in common with her husband, whom historian Richard O'Conner characterized as "an amiably dim fellow whose main interest in life was consuming bowls of dumplings drenched in gravy". Despite their different personalities, the marriage was fruitful, and after four miscarriages, four sons—including Maximilian—would reach adulthood. Adhering to traditions inherited from the Spanish court during Habsburg rule, Maximilian's upbringing was closely supervised. Until his sixth birthday, he was cared for by Baroness Louise von Sturmfeder, who was his aja (then rendered "nurse", now nanny). Afterwards, his education was entrusted to a tutor. Most of Maximilian's day was spent in study. 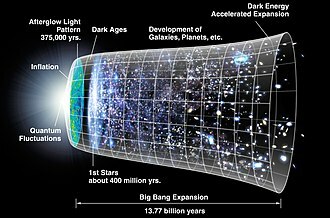 The thirty-two hours per week of classes at age 7 steadily grew until it reached fifty-five hours per week by the time he was 17. The disciplines were diverse: ranging from history, geography, law and technology, to languages, military studies, fencing and diplomacy. 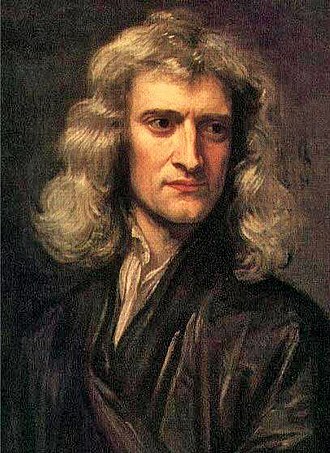 In addition to his native German, he eventually learned to speak Hungarian, Slovak, English, French, Italian and Spanish. From an early age, Maximilian tried to surpass his older brother Franz Joseph in everything; attempting to prove to all that he was the better qualified of the two and thus deserving of more than second place status. The highly restrictive environment of the Austrian court was not enough to repress Maximilian's natural openness. He was joyful, highly charismatic and able to captivate those around him with ease. Although he was a charming boy, he was also undisciplined. He mocked his teachers and was often the instigator of pranks—even including his uncle, Emperor Ferdinand I, among his victims. Nonetheless Maximilian was very popular. His attempts to outshine his older brother and ability to charm opened a rift with the aloof and self-contained Franz Joseph that would widen as years passed, and the times when both were close friends in childhood would be all but forgotten. 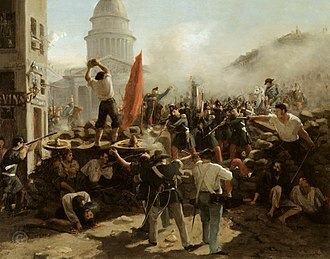 In 1848, revolutions erupted across Europe. In the face of protests and riots, Emperor Ferdinand I abdicated in favor of Maximilian's brother, who became Francis Joseph I. Maximilian accompanied him on campaigns to put down rebellions throughout the Empire. 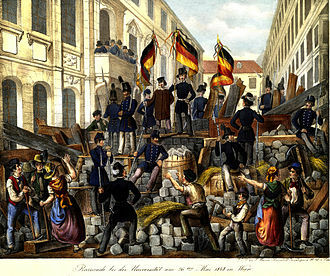 Only in 1849 would the revolution be stamped out in Austria, with hundreds of rebels executed and thousands imprisoned. Maximilian was horrified at what he regarded as senseless brutality and openly complained about it. 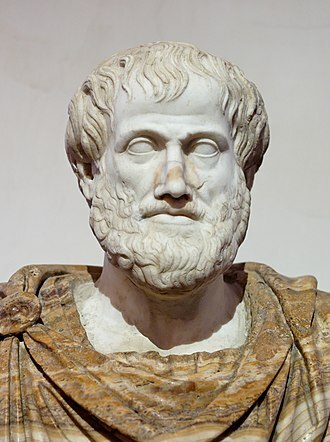 He would later remark: "We call our age the Age of Enlightenment, but there are cities in Europe where, in the future, men will look back in horror and amazement at the injustice of tribunals, which in a spirit of vengeance condemned to death those whose only crime lay in wanting something different to the arbitrary rule of governments which placed themselves above the law". 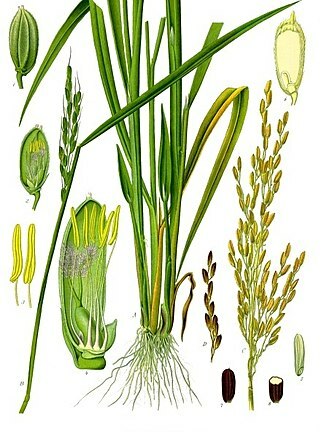 Maximilian was a particularly clever boy who displayed considerable culture in his taste for the arts, and he demonstrated an early interest in science, especially botany. When he entered military service, he was trained in the Austrian Navy. He threw himself into this career with so much zeal that he quickly rose to high command. He was made a lieutenant in the navy at the age of eighteen. In 1854, he sailed as commander in the corvette Minerva, on an exploring expedition along the coast of Albania and Dalmatia. Maximilian was especially interested in the maritime and undertook many long-distance journeys (for Brazil) on the frigate Elisabeth. In 1854, he was only 22 years—as a younger brother of the Emperor, and thus a member of the ruling family—he was appointed as commander in chief of the Austrian Navy (1854–1861), which he reorganized in the following years. Like Archduke Friedrich (1821–1847) before him, Maximilian had a keen private interest in the fleet, and with him the Austrian naval force gained an influential supporter from the ranks of the Imperial Family. This was crucial as sea power was never a priority of Austrian foreign policy and the navy itself was relatively little known or supported by the public. It was only able to draw significant public attention and funds when it was actively supported by an imperial prince. As Commander-in-Chief, Maximilian carried out many reforms to modernise the naval forces, and was instrumental in creating the naval port at Trieste and Pola (now Pula) as well as the battle fleet with which admiral Wilhelm von Tegetthoff would later secure his victories. He also initiated a large-scale scientific expedition (1857–1859) during which the frigate SMS Novara became the first Austrian warship to circumnavigate the globe. In his political views, Archduke Maximilian was very much influenced by the progressive ideas in vogue at the time. 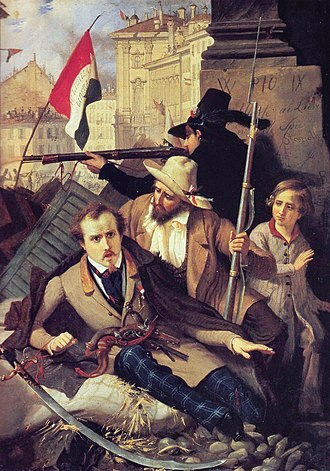 He had a reputation as a liberal, and this was one of several considerations leading to his appointment as Viceroy of the Kingdom of Lombardy–Venetia in February 1857. Emperor Franz Joseph had decided on the need to replace the elderly soldier Joseph Radetzky von Radetz in this position; to divert growing discontent amongst the Italian population through token liberalization; and finally to encourage a degree of personal loyalty to the Habsburg dynasty. On 27 July 1857, in Brussels, Archduke Maximilian married his second cousin Princess Charlotte of Belgium, the daughter of Leopold I, King of the Belgians, and Louise of Orléans. She was first cousin to both Queen Victoria and Prince Albert. Maximilian and Charlotte had no children together. They lived as the Austrian regents in Milan or Viceroys of Lombardy-Venetia from 1857 until 1859, when Emperor Franz Joseph, angered by his brother's liberal policies, dismissed him. Shortly after, Austria lost control of most of its Italian possessions. Maximilian then retired to Trieste, near which he built the castle Miramare. At the same time the couple acquired a converted monastery on the island of Lokrum as a holiday residence. Both estates had extensive gardens, reflecting Maximilian's horticultural interests. 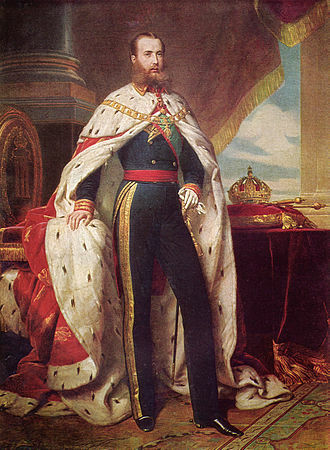 In 1859, Ferdinand Maximilian was first approached by Mexican monarchists—members of the Mexican aristocracy, led by local nobleman José Pablo Martínez del Río—with a proposal to become the Emperor of Mexico. The Habsburg family had ruled the Viceroyalty of New Spain from its establishment until the Spanish throne was inherited by the Bourbons. Maximilian was considered to have more potential legitimacy than other royal figures, but was unlikely to ever rule in Europe due to his elder brother. On 20 October 1861 in Paris, Maximilian received a letter from Gutierrez de Estrada asking him to take the Mexican throne. 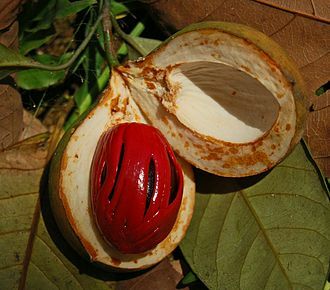 He did not accept at first, but sought to satisfy his restless desire for adventure with a botanical expedition to the tropical forests of Brazil. 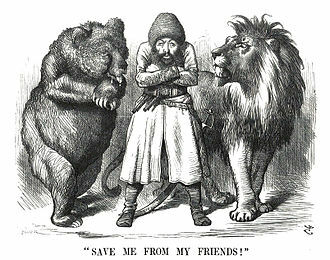 However, Maximilian changed his mind after the French intervention in Mexico. 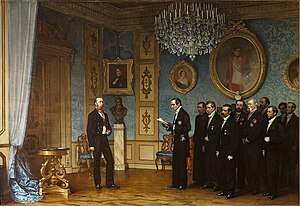 At the invitation of Napoleon III, after General Élie-Frédéric Forey's capture of Mexico City and a French-staged plebiscite that confirmed the proclamation of the empire, Maximilian consented to accept the crown in October 1863. His decision involved the loss of all his rights of nobility in Austria, though he was not informed of this until just before he left. Archduchess Charlotte was thereafter known as "Her Imperial Majesty Empress Carlota". In April 1864, Archduke Ferdinand Maximilian stepped down from his duties as Chief of Naval Section of the Austrian Navy. He traveled from Trieste aboard SMS Novara, escorted by the frigates SMS Bellona (Austrian) and Thémis (French), and the Imperial yacht Phantasie led the warship procession from his palace at Miramare out to sea. They received a blessing from Pope Pius IX, and Queen Victoria ordered the Gibraltar garrison to fire a salute for Maximilian's passing ship. The new emperor of Mexico landed at Veracruz on 29 May 1864, and received a cold reception from the townspeople. Veracruz was a liberal town, and the liberal voters were opposed to having Maximilian on the throne. He had the backing of Mexican conservatives and Napoleon III, but from the very outset he found himself involved in serious difficulties since the Liberal forces led by President Benito Juárez refused to recognize his rule. There was continuous fighting between the French expeditionary force plus Maximilian's locally recruited Imperial troops on the one side and the Mexican Republicans on the other. The Imperial couple chose as their seat Mexico City. The Emperor and Empress set up their residence at Chapultepec Castle, located on the top of a hill formerly at the outskirts of Mexico City that had been a retreat of Aztec emperors. Maximilian ordered a wide avenue cut through the city from Chapultepec to the city center; originally named Paseo de la Emperatriz, it is today Mexico City's famous boulevard, Paseo de la Reforma. He also acquired a country retreat at Cuernavaca. The royal couple made plans to be crowned at the Catedral Metropolitana but, due to the constant instability of the regime, the coronation was never carried out. Maximilian was shocked by the living conditions of the poor in contrast to the magnificent haciendas of the upper class. Empress Carlota began holding parties for the wealthy Mexicans to raise money for poor houses. One of Maximilian's first acts as Emperor was to restrict working hours and abolish child labour. He cancelled all debts for peasants over 10 pesos, restored communal property and forbade all forms of corporal punishment. He also broke the monopoly of the Hacienda stores and decreed that henceforth peons could no longer be bought and sold for the price of their debt. As Maximilian and Carlota had no children, they adopted Agustín de Iturbide y Green and his cousin Salvador de Iturbide y de Marzán, both grandsons of Agustín de Iturbide, who had briefly reigned as Emperor of Mexico in the 1820s. Iturbide and his cousin were granted the title Prince de Iturbide and style of Highness by imperial decree of 16 September 1865 and were ranked after the reigning family. They intended to groom Agustín as heir to the throne. However, Maximilian never intended to give the crown to the Iturbides because he considered that they were not of royal blood. It was all a charade directed at his brother Archduke Karl Ludwig of Austria, as he explained himself: either Karl would give him one of his sons as an heir, or else he would bequeath everything to the Iturbide children. To the dismay of his conservative allies, Maximilian upheld several liberal policies proposed by the Juárez administration – such as land reforms, religious freedom, and extending the right to vote beyond the landholding class. At first, Maximilian offered Juárez an amnesty if he would swear allegiance to the crown, even offering the post of Prime Minister, which Juárez refused. After the end of the American Civil War, the United States government used increasing diplomatic pressure to persuade Napoleon III to end French support of Maximilian and to withdraw French troops from Mexico. Washington began supplying partisans of Juárez and his ally Porfirio Díaz by "losing" arms depots for them at El Paso del Norte at the Mexican border. The prospect of a United States invasion to reinstate Juárez caused a large number of Maximilian's loyal adherents to abandon the cause and leave the capital. 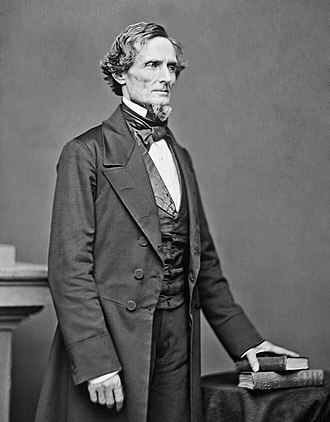 Meanwhile, Maximilian invited ex-Confederates to move to Mexico in a series of settlements called the "Carlota Colony" and the New Virginia Colony with a dozen others being considered, a plan conceived by the internationally renowned U.S. Navy oceanographer and inventor Matthew Fontaine Maury. Maximilian also invited settlers from "any country" including Austria and the other German states. 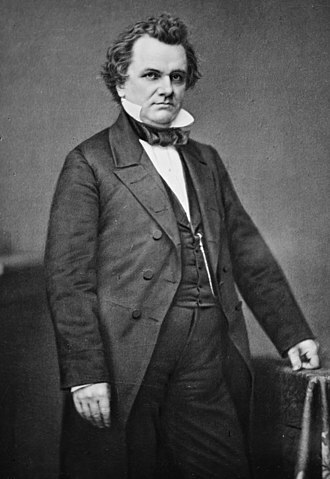 Maximilian issued his Black Decree on October 3, 1865. Its first article stated that: "All individuals forming a part of armed bands or bodies existing without legal authority, whether or not proclaiming a political pretext, whatever the number of those forming such band, or its organization, character, and denomination, shall be judged militarily by the courts martial. If found guilty, even though only of the fact of belonging to an armed band, they shall be condemned to capital punishment, and the sentence shall be executed within twenty-four hours". It is calculated that more than eleven thousand of Juarez's supporters were executed as a result of the Black Decree, but at the end it only inflamed the Mexican Resistance. 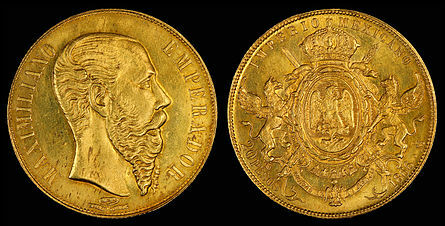 Nevertheless, by 1866, the imminence of Maximilian's abdication seemed apparent to almost everyone outside Mexico. That year, Napoleon III withdrew his troops in the face of Mexican resistance and U.S. opposition under the Monroe Doctrine, as well as increasing his military contingent at home to face the ever-growing Prussian military and Bismarck. Carlota travelled to Europe, seeking assistance for her husband's regime in Paris and Vienna and, finally, in Rome from Pope Pius IX. Her efforts failed, and she suffered a deep emotional collapse and never went back to Mexico. After her husband was executed by Republicans the following year, she spent the rest of her life in seclusion, never admitting her husband's death, first at Miramare Castle in Trieste, Austria-Hungary, then Italy, and then at Bouchout Castle in Meise, Belgium, where she died on 19 January 1927. Though urged to abandon Mexico by Napoleon III himself, whose troop withdrawal from Mexico was a great blow to the Mexican Imperial cause, Maximilian refused to desert his followers. Maximilian allowed his followers to determine whether or not he abdicated. Faithful generals such as Miguel Miramón, Leonardo Márquez, and Tomás Mejía vowed to raise an army that would challenge the invading Republicans. 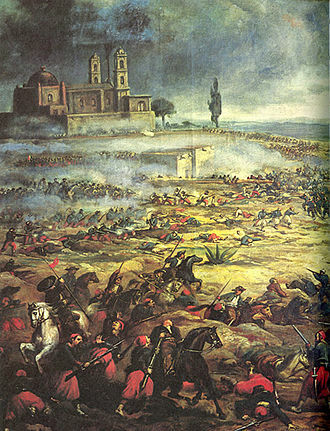 Maximilian fought on with his army of 8,000 Mexican loyalists. Withdrawing, in February 1867, to Santiago de Querétaro, he sustained a siege for several weeks, but on May 11 resolved to attempt an escape through the enemy lines. This plan was sabotaged by Colonel Miguel López who was bribed by the Republicans to open a gate and lead a raiding party, though with the agreement that Maximilian would be allowed to escape. 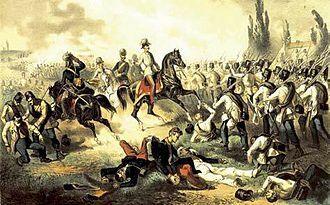 The city fell on 15 May 1867 and Maximilian was captured the next morning after the failure of an attempt to escape through Republican lines by a loyal hussar cavalry brigade led by Felix Salm-Salm. Following a court-martial, he was sentenced to death. Many of the crowned heads of Europe and other prominent figures (including the eminent liberals Victor Hugo and Giuseppe Garibaldi) sent telegrams and letters to Mexico pleading desperately for the Emperor's life to be spared. Although he liked Maximilian on a personal level, Juárez refused to commute the sentence in view of the Mexicans who had been killed fighting against Maximilian's forces, and because he believed it was necessary to send a message that Mexico would not tolerate any government imposed by foreign powers. Felix Salm-Salm and his wife masterminded a plan and bribed the jailors to allow Maximilian to escape execution. However, Maximilian would not go through with the plan because he felt that shaving his beard to avoid recognition would ruin his dignity if he were to be recaptured. The sentence was carried out in the Cerro de las Campanas at 6:40am on the morning of 19 June 1867, when Maximilian, along with Generals Miramón and Mejía, was executed by a firing squad. He spoke only in Spanish and gave each of his executioners a gold coin not to shoot him in the head so that his mother could see his face. His last words were, "I forgive everyone, and I ask everyone to forgive me. May my blood, which is about to be shed, be for the good of the country. Viva Mexico, viva la independencia!" Generals Miramón and Mejía standing to Maximilian's right, were killed by the same volley as the emperor, fired by the fifteen-man (twenty-one in other accounts) execution party. Maximilian and Miramón died almost immediately, the emperor calling out the single word hombre, but Mejía's death was a more extended one. After his execution, Maximilian's body was embalmed and displayed in Mexico. Early the following year, the Austrian admiral Wilhelm von Tegetthoff was sent to Mexico aboard SMS Novara to take the former emperor's body back to Austria. After arriving in Trieste, the coffin was taken to Vienna and placed within the Imperial Crypt, on 18 January 1868, where it can be viewed today. The Emperor Maximilian Memorial Chapel was constructed on the hill where his execution took place. In the wake of his death, carte-de-visite cards with photographs commemorating his execution circulated both among his followers and among those who wished to celebrate his death. One such card featured a photograph of the shirt he wore to his execution, riddled with bullet holes. The composer Franz Liszt included a "Marche funèbre, en mémoire de Maximilian I, empereur de Mexique" (a funeral march in memory of Maximilian I) among the pieces in his famous collection of piano pieces entitled Années de pèlerinage. Grand Cross of the Order of Saint Ferdinand and of Merit. ^ "Such an easy assumption of an improbable sexual relationship", said Alan Palmer, "fails to understand the nature of the attachment binding" Sophie and Reichstadt, who saw themselves as alien misfits stranded in a foreign court. To Palmer, their "confidences were those of a brother and elder sister rather than of lovers". "There is no documentary evidence to suggest that she and the Duke of Reichstadt were ever lovers", according to Joan Haslip. "Whether the young Napoleon was actually the father of Maximilian could only be the subject of fascinating conjecture, something for courtiers and servants to gossip about on the long winter nights in the Hofburg [Palace]", said Richard O'Connor. "There is not a shred of evidence to support the rumors", affirmed Jasper Ridley. "It was said that Sophie confessed", continued Ridley, "in a letter to her father confessor, that Maximilian was the son of Napoleon, and that the letter was found and destroyed in 1859, but there is no reason to believe this story ... would she have had a sexual relationship with a boy whom she regarded as a child and a younger brother?" The birth of two more sons after the death of Reichstadt in 1832 lessened even more the credibility of these claims. ^ Harding 1934, pp. 175. ^ "Charlotte of Mexico's Misfortune" (PDF). New York Times. March 6, 1885. ^ a b Haslip 1972, p. 17. ^ Antonio Schmidt-Brentano The Austrian admirals Volume I, 1808–1895, Library Verlag, Osnabrück 1997, pp. 93–104. ^ Antonio Schmidt-Brentano: Die K.K bzw. K.u.K Generalität 1816–1918. Österreichisches Staatsarchiv, Wien 2007, S. 130 (PDF). ^ Highes, Victoria. A Lurid Grandeur. Maximillian and Carlota of Mexico. pp. 38–39. ISBN 9-780692-723043. ^ Smith, Gene. Maximillian and Carlotta. pp. 81–83. ISBN 0-688-00173-4. ^ Smith, Gene. Maximillian and Carlotta. p. 159. ISBN 0-688-00173-4. ^ Parkes 1960, p. 261. ^ Chartrand, Rene. The Mexican Adventure 1861-67. pp. 18–23. ISBN 1-85532-430-X. 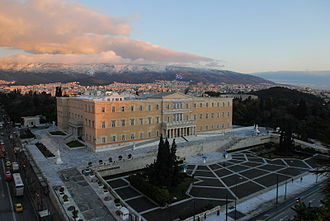 ^ Decreto Imperial del 16 de Septiembre de 1865 (in Spanish) – via Wikisource. ^ Reuter, Paul H. (1965). "United States-French Relations Regarding French Intervention in Mexico: From the Tripartite Treaty to Querétaro". Southern Quarterly. 6 (4): 469–489. ^ Rolle, Andrew F. (1992). The Lost Cause: The Confederate Exodus to Mexico. University of Oklahoma Press. ISBN 0-8061-1961-6. ^ McAllen, M. M. Maximilian and Carlota. Europe's Last Empire in Mexico. p. 386. ISBN 978-1-59534-263-8. ^ Parkes 1960, p. 273. ^ McAllen, M. M. Maximilian and Carlota. Europe's Last Empire in Mexico. p. 387. ISBN 978-1-59534-263-8. ^ "Homage to the Martyrs of the Second Mexican Empire". Archived from the original on 2014-05-03. Harding, Bertita (1934). Phantom Crown: The story of Maximilian & Carlota of Mexico. New York: Blue Ribbon Books. ISBN 1434468925. Hyde, H. Montgomery (1946). Mexican Empire: the history of Maximilian and Carlota of Mexico. London: Macmillan & Co.
O'Connor, Richard (1971). The Cactus Throne: the tragedy of Maximilian and Carlotta. New York: G. P. Putnam's Sons. ISBN 0-04-972005-8. Parkes, Henry (1960). A History of Mexico. Boston: Houghton Mifflin. ISBN 0-395-08410-5. Hanna, Alfred Jackson, and Kathryn Abbey Hanna. Napoleon III and Mexico: American triumph over monarchy (1971). Ibsen, Kristine (2010). Maximilian, Mexico, and the Invention of Empire. Nashville: Vanderbilt University Press. ISBN 978-0-8265-1688-6. Similarly, a formal alliance does not necessarily mean that one country lies within anothers sphere of influence. High levels of exclusivity have historically been associated with levels of conflict. In more extreme cases, a country within the sphere of influence of another may become a subsidiary of that state, the system of spheres of influence by which powerful nations intervene in the affairs of others continues to the present. It is often analyzed in terms of superpowers, great powers, for example, during the height of its existence in World War II, the Japanese Empire had quite a large sphere of influence. The Japanese government directly governed events in Korea, Taiwan, sometimes portions of a single country can fall into two distinct spheres of influence. The term is used to describe non-political situations, e. g. a shopping mall is said to have a sphere of influence which designates the geographical area where it dominates the retail trade. Many areas of the world are considered to have inherited culture from a sphere of influence. According to a protocol attached to the Molotov-Ribbentrop pact of 1939, Northern and Eastern Europe were divided into Nazi. In the North, Finland and Latvia were assigned to the Soviet sphere, poland was to be partitioned in the event of its political rearrangement—the areas east of the Narev and San Rivers going to the Soviet Union while Germany would occupy the west. Lithuania, adjacent to East Prussia, would be in the German sphere of influence, another clause of the treaty stipulated that Bessarabia, part of Romania, would join the Moldovan ASSR and become the Moldovan SSR under the control of Moscow. The Soviet invasion of Bukovina on 28 June 1940 violated the Molotov-Ribbentrop Pact, from 1941 and the German attack on the Soviet Union, the Allied Coalition operated on the unwritten assumption that the Western Powers and the Soviet Union had each its own sphere of influence. Western Europe, Oceania and South Korea, among other places, were said to lie under the sphere of influence of the United States. It was created with the support of Napoleon III of France, who attempted to establish a monarchist ally in the Americas. A referendum confirmed the coronation of the Austrian Archduke Ferdinand Maximilian, the Empire came to an end on June 19,1867, with the execution of Emperor Maximilian I. The rule of Emperor Maximilian was blemished by constant conflict, the two factions had set up parallel governments, the Conservatives in Mexico City controlling central Mexico and the Liberals in Veracruz. The United States government viewed Emperor Maximilian as a French puppet and they demanded the withdrawal of French forces, and France acceded. 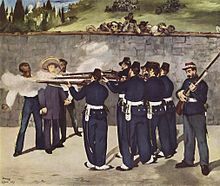 In 1867, the fell and Maximilian was executed at the orders of Benito Juárez. Maximilian proved to be too liberal for the conservatives, and too conservative for the liberals and he regarded Mexico as his destiny and made many contributions. Before his death, Maximilian adopted the grandsons of the first Mexican emperor, Agustín de Iturbide, Agustín de Iturbide y Green, Napoleon III had more ambitious goals in mind than merely the recovery of Frances debts. Heavily influenced by his wife the Empress Eugenie, he was bent on reviving the Mexican monarchy. Prior to 1861 any interference in the affairs of Mexico by any of the European powers would have viewed as a challenge to the United States. However, in 1861 the United States was embroiled in its own bloody conflict, the American Civil War, encouraged by the Empress Eugenie, who saw herself as the champion of the Catholic Church in Mexico, Napoleon III took advantage of the situation. 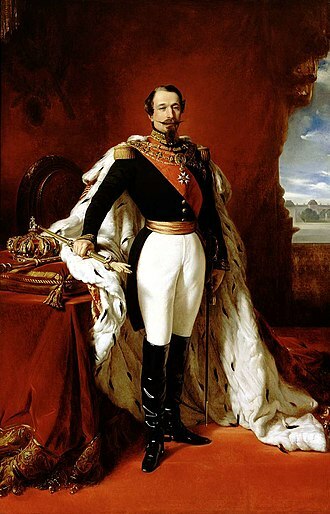 Napoleon III saw the opportunity to make France the great modernizing influence in the Western Hemisphere as well as enabling the country to capture the South American markets. To give him encouragement, there was his half brother, the duc de Morny. 1832, Archduke Ferdinand Maximilian born on 6 July, the son of Archduke Franz Karl and his wife Sophie in Schönbrunn Palace. 1851, Begins career in the Imperial and Royal Navy with the rank of lieutenant,1856, The construction of his castle of Miramar near the Adriatic port of Trieste began. Maximilian I was Duke of Zweibrücken from 1795 to 1799, Prince-Elector of Bavaria from 1799 to 1805, King of Bavaria from 1806 to 1825. He was a member of the House of Palatinate-Birkenfeld-Zweibrücken, a branch of the House of Wittelsbach, the son of the Count Palatine Frederick Michael of Zweibrücken-Birkenfeld and Maria Francisca of Sulzbach, was born on the 27 May 1756 at Schwetzingen, between Heidelberg and Mannheim. After the death of his father in 1767, he was left at first without parental supervision, Maximilian was carefully educated under the supervision of his uncle, Duke Christian IV of Zweibrücken, who settled him in the Hôtel des Deux-Ponts. He became Count of Rappoltstein in 1776 and took service in 1777 as a colonel in the French army and he rose rapidly to the rank of major-general. From 1782 to 1789, he was stationed at Strasbourg, during his time at the University of Strasbourg, Klemens von Metternich, the future Austrian chancellor, was for some time accommodated by Prince Maximilian. By the outbreak of the French Revolution, Maximilian exchanged the French for the Austrian service, on 1 April 1795, Maximilian succeeded his brother Charles II as duke of Zweibrücken, however his duchy was entirely occupied by the French at the time. Maximilians sympathy with France and the ideas of enlightenment which at once manifested itself when he acceded to the throne of Bavaria and he closed the University of Ingolstadt in May 1800 and moved it to Landshut. In foreign affairs, Maximilian Josephs attitude was from the German point of view less commendable and he never had any sympathy with the growing sentiment of German nationality, and his attitude was dictated by wholly dynastic, or at least Bavarian, considerations. 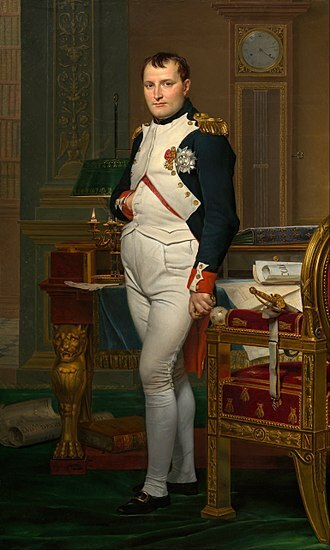 Until 1813, he was the most faithful of Napoleons German allies and his reward came with the Treaty of Pressburg, by the terms of which he was to receive the royal title and important territorial acquisitions in Swabia and Franconia to round off his kingdom. He assumed the title of king on 1 January 1806, on 15 March, he ceded the Duchy of Berg to Napoleons brother-in-law Joachim Murat. 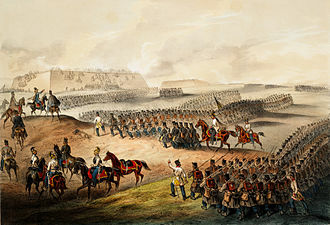 On 14 October, Bavaria made a declaration of war against Napoleonic France. The treaty was passionately backed by Crown Prince Ludwig and by Marshal von Wrede, by the first Treaty of Paris, however, he ceded Tyrol to Austria in exchange for the former Grand Duchy of Würzburg. The Federative Constitution of Germany of the Congress of Vienna was proclaimed in Bavaria, not as a law, Maximilian died at Nymphenburg Palace, near Munich, on 13 October 1825 and was succeeded by his son Ludwig I. Maximilian is buried in the crypt of the Theatinerkirche in Munich, under the reign of Maximilian Joseph the Bavarian Secularization led to the nationalisation of cultural assets of the Church. 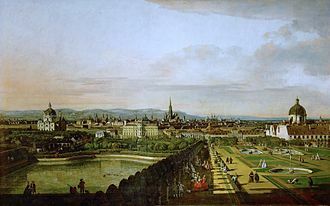 In 1808 he founded the Academy of Fine Arts Munich, the city of Munich was extended by the first systematic expansion with the new Brienner Strasse as core. 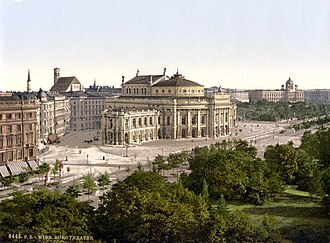 In 1810 Max Joseph ordered construction of the National Theatre Munich in French neo-classic style and it was only revealed in 1835 since the king had rejected to be eternalized in sitting position. A corvette is a small warship. It is traditionally the smallest class of vessel considered to be a proper warship, the warship class above the corvette is that of the frigate, while the class below was historically that of the sloop-of-war. The modern types of ship below a corvette are coastal patrol craft, in modern terms, a corvette is typically between 500 tons and 2,000 tons although recent designs may approach 3,000 tons, which might instead be considered a small frigate. The word corvette is first found in Middle French, a diminutive of the Dutch word corf, meaning a small ship, from the Latin corbis, the rank corvette captain, equivalent in many navies to lieutenant commander, derives from the name of this type of ship. During the Age of Sail, corvettes were one of many types of smaller than a frigate. They were very closely related to sloops-of-war, the role of the corvette consisted mostly of coastal patrol, fighting minor wars, supporting large fleets, or participating in show-the-flag missions. The English Navy began using small ships in the 1650s, the first reference to a corvette was with the French Navy in the 1670s, which may be where the term originated. The French Navys corvettes grew over the decades and by the 1780s they were ships of 20 guns or so, the British Navy did not adopt the term until the 1830s, long after the Napoleonic Wars, to describe a small sixth-rate vessel somewhat larger than a sloop. Most corvettes and sloops of the 17th century were around 40 to 60 ft in length and they carried four to eight smaller guns on a single deck. Over time, vessels of increasing size and capability were called corvettes, by 1800, they reached lengths of over 100 ft, ships during the steam era became much faster and more manoeuvrable than their sail ancestors. Corvettes during this era were used alongside gunboats during colonial missions. Battleships and other vessels were unnecessary when fighting the indigenous people of the Far East. The modern corvette appeared during World War II as an easily built patrol, first Lord of the Admiralty Winston Churchill, Prime Minister, had a hand in reviving the name corvette.